"Dioxidine" is an antibacterial drug with wide spectrum of action. In particular, in ENT practice, it is used for gargling in a number of diseases. Under the action of the drug occurs by the elimination of the infection and regeneration of cells lining that helps the healing process. "Dioxidine" promotes rapid cleaning of infected surfaces, particularly mucosa of the oral cavity and throat. The drug is used for treatment of suppurative bacterial infections caused by sensitive microflora in case of failure of other lekarstvennyh funds or their poor tolerability. Including "Dioxidine" is used against infections resistant to antibiotics. For gargling "Dioxidine" is used in the treatment of pharyngitis, sore throats and tonsillitis. Rinse with a solution of "Dioksidina" are assigned only in severe cases when other medications do not help. 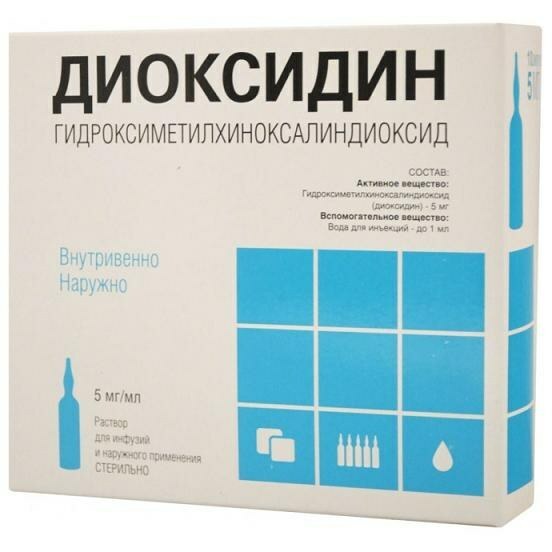 For gargle use 1% solution "Dioksidina" in ampoules. To do this, 1 ampoule of the drug is diluted in 1 Cup of warm water, Rasbora isotonic sodium chloride or water for injection. The course of treatment "Dioxidine" is 5 days. To use the drug for a longer time only on the recommendation of a physician. Rinsing is carried out 3 times a day. Small amount of the solution gaining in the mouth and tilting the head back, gargle for a few seconds. After that, the product should be spit out and repeat the procedure to make full use of the solution. Rinse swallow the drug should not be. In some cases, before using the "Dioksidina" perhaps the purpose of rinsing with hydrogen peroxide, which helps eliminate inflammation of the upper layers of the epithelium. The drug has embriotoksicescoe effect, and therefore its use is contraindicated during pregnancy. Also "Dioxidine" do not use during lactation. The drug is not rekomenduetsya administer to children due to its possible toxic effects on the body. The local application "Dioxidine" partially absorbed from the damaged surface and excreted by the kidneys. In this regard, the drug is recommended with caution use in renal failure, including when the kidney problems in history. As a rule, treatment of diseases of the throat, according to a drug occurs without complications. However, in some cases, "Dioxidine" can cause allergic reactions. This can happen even in spite of the low concentration of active substances of the drug in the local application. In the case of voiceone side effects is recommended to start taking antihistamines and seek medical attention.